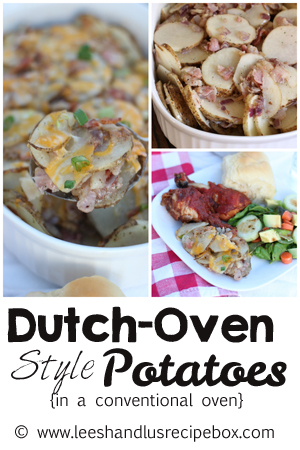 We LOVE dutch oven potatoes, meat, cobbler, etc! Dutch oven food is kind of a summer time thing that we look forward to all year long. However, the weather doesn't always cooperate for us when we plan to do a dutch oven night. So in our anticipation for dutch oven potatoes a few weeks ago I had to resort to other options due to rainy weather. I threw my usual dutch oven potato mixture (cheesy, bacony, garlicy, oniony, potatoy goodness) into a casserole dish and baked it in the oven. 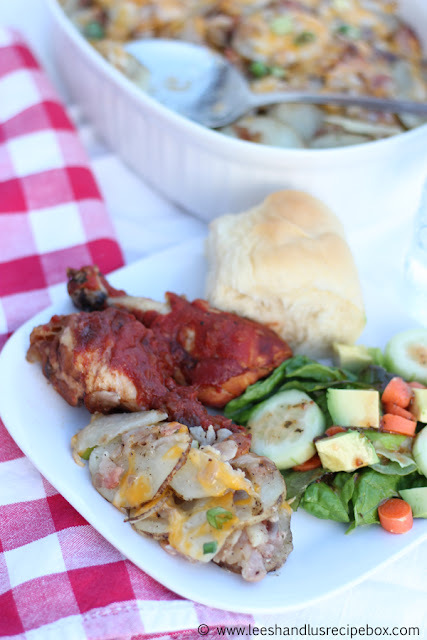 The results were great and almost identical to the dutch oven style of potatoes that we love. If you have pre-cooked bacon this really comes together in a flash (I'll be sharing soon how I like to cook bacon). Now that we have this back up method to making dutch oven potatoes we can make them all year long. YES! 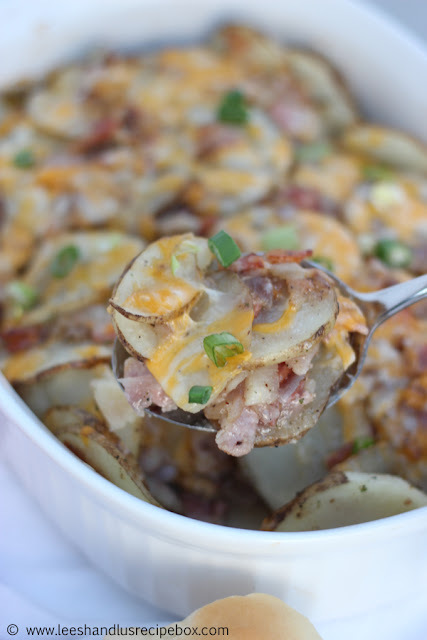 Serve these with your favorite BBQ meat and a side salad and you have the perfect meal! If you don't have pre-cooked bacon on hand, cook bacon and set aside. Meanwhile, chop onion and saute in butter/olive oil in a medium-size skillet until soft and golden (about 5 minutes). Slice potatoes thinly (I like to use the slicing blade that goes with my food processor, that way I can have all the potatoes sliced in a matter of seconds). Lightly grease a 8 x 8 or 9 x 9 glass casserole dish. 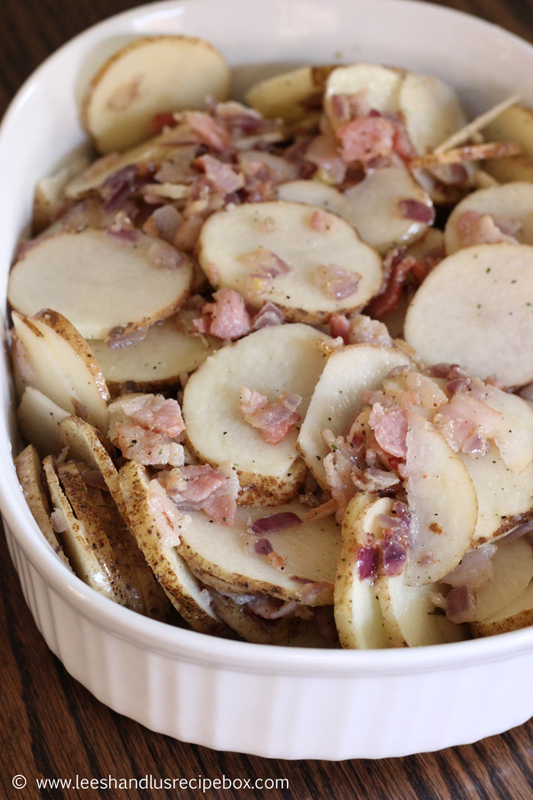 In a large mixing bowl toss the following together: sliced potatoes, bacon bits, sauteed onion and garlic salt. Pour mixture into casserole dish, pour water over top and cover tightly with aluminum foil. Bake in a preheated 375 degree oven for 1 hour. When finished cooking, test potatoes for done-ness. Sprinkle with grated cheese, cover with foil and let it melt. Serve warm and enjoy. Garnish with green onion if desired. Indeed a good post, And I believe having a dutch oven in our all important kitchen is crucial it helps us cook the best food for our family,, so that's why we need the best dutch oven, and recently I have purchased one of the top dutch ovens available, because i want to make best food with the best dutch oven.